Sound Gong Bath provides regular gong meditations for groups of people at public venues throughout the South West of England. I travel throughout the South West of England to run gong baths for events such as yoga, holistic retreats or spiritual festivals. I also run gong baths for weddings and private celebrations. A gong bath is a relaxing and blissful experience. During a gong bath you are bathed in sound waves, there are no clothes removed or water involved, you simply lie down on crash mats (which I supply), wrap yourself in a blanket, lay your head on a pillow, close your eyes and relax. The gongs are normally played for an hour. The sounds that come out of the gongs are difficult for the human brain to follow, and you will most likely drift into a deep meditative state. This can happen once or many times throughout a session, everyone can have their own experience and every session is different. The gong bath is very good at relieving pain, stress or dealing with personal issues, it tends to bring people to a blissful state that can often last for many days. When the session ends I gently bring the group back with small tingling bells and my Heart sounding bowl, and sometimes other instruments. Is there a habit of thinking or behaving that is holding you back from being your best self? Sometimes such habits go back to earliest childhood and are so familiar; they may not be recognised as negative and damaging. Many people are held back by limiting habits of belief, which adversely affect their mental and/or physical health. Here is a quick view of the 2019 public Gong Baths that are booked. 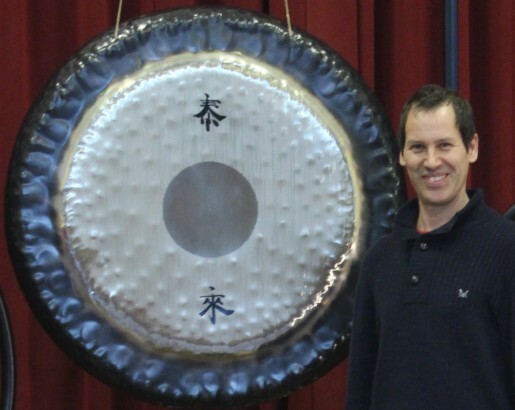 Here's how a gong bath attendee explains it. I travel the South West of England to run gong baths for events such as yoga, holistic retreats or spiritual festivals. I also run gong baths for weddings, Birthdays and Christmas celebrations and much more. Tiverton 12th April 2019. spaces available. Taunton 13th April 2019. A few spaces available. Gloucestershire 20th April 2019. spaces available. Barnstaple 20th April 2019. Spaces available. A gong bath is a form of sound therapy where the gongs are played in a therapeutic way to bring about relaxation; this can be done as a one to one or group treatment. Ideally you will experience the gong bath lying comfortably on your back on crash mats that I supply. You will need to bring along a blanket and a pillow.